When British P.O.W.s build a vital railway bridge in enemy-occupied Burma, Allied commandos are assigned to destroy it in David Lean's epic World War II adventure The Bridge On The River Kwai. Spectacularly produced, The Bridge On The River Kwai captured the imagination of the public and won seven 1957 Academy Awards, including Best Picture, Best Actor (Alec Guinness), and Best Director. Even its theme song, an old WWI whistling tune, the "Colonel Bogey March," became a massive wordwide hit. The Bridge On The River Kwai continues today as one of the most memorable cinematic experiences of all time. Academy Awards: Won for Best Picture; Best Director; Best Screenplay; Best Actor-Alec Guinness; Best Cinematography; Best Film Editing; Best Score-Malcolm Arnold. Nominated for Best Supporting Actor-Sessue Hayakawa. DVD: Widescreen 2.55:1/16x9; audio English Dolby Digital 5.1 & Dolby Surround 2.0, French, Spanish & Portuguese Dolby Digital 2.0; subtitles English, French, Spanish, Portuguese, Chinese, Korean, Thai; closed-captioned; single sided - dual layered; 40 chapters; Rated PG; 162 min. ; $39.95; street date 11/21/00. Supplements: “The Making of The Bridge on the River Kwai” 53-minute Documentary; “Rise and Fall of a Jungle Giant” Six-minute Original Featurette; “USC Short Film Introduced By William Holden” 15-minute Movie; “An Appreciation By John Milius” Eight-minute Featurette; Isolated Score; Photo Montage; Theatrical Trailers; Talent Files; Reproduction of Original Souvenir Book; DVD-ROM Materials. If you’re looking for my usual long-winded discussion of my impressions of The Bridge on the River Kwai, you’ve come to the wrong place. I blathered on about it in my coverage of film’s basic single-DVD edition. Anyone who wants to inspect my opinions of the movie can check out that article here. In this review, however, I’ll stick to the nitty-gritty: the quality of the material on the two-DVD release. So let’s get started! 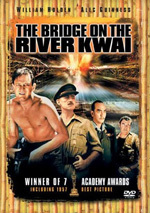 The Bridge on the River Kwai appears in an aspect ratio of approximately 2.55:1 on this single-sided, double-layered DVD; the image has been enhanced for 16X9 televisions. While the movie generally looked pretty good, it definitely showed its age much of the time. Sharpness was one of the DVD’s strong points. For the vast majority of the film, the picture appeared crisp and well-defined. A few instances of mild softness occurred, but these were minor and caused little concern. Moiré effects appeared a few times but were rare, and I saw moderate artifacts from the anamorphic downconversion on my 4X3 TV. Not surprisingly given the age of the movie, print flaws caused the DVD’s biggest problems. Actually, Kwai seemed relatively free of defects, though it displayed some ugly moments; for example, the opening scenes presented lots of grain and debris. The image quickly cleaned up, however, and maintained a fairly fresh appearance for most of the remainder of the film. Some grain could be seen, and intermittent examples of grit, speckles, dirt, small hairs and vertical lines also crop up at times. I also witnessed mild side-to-side jittering of the piece on a few occasions. Colors seemed fairly pale and faded, but I didn’t find these to cause significant concerns because of the film’s setting. The environment featured mainly tans and browns, with some greens from the foliage; occasionally I saw brighter hues, but the majority of the tones tended toward “military drab”. I felt the colors should have been better-saturated and clearer, but they generally were acceptable within the film’s scheme. Black levels usually looked deep and fairly dark with good contrast. For the most part, shadow detail seemed appropriately heavy but not excessively thick; I found the majority of the low-light situations to come across as clear and very watchable. The exceptions related to the usual culprit: “day for night” photography. That technique frequently results in overly dark images that can be very hard to see, and this occurred during Kwai whenever the method was used. Nonetheless, despite the various flaws, I thought Kwai presented a pretty solid picture. I’ve seen better images for material of this era or from earlier years, but not many. Also relatively strong is the remixed Dolby Digital 5.1 soundtrack of Kwai. Not surprisingly, the forward soundfield clearly dominates the action. The music and effects created a nice spread across the front speakers and offered a good sense of spatiality. I discerned some mild panning from side to side as well, though this effect was inconsistent; for instance, we might hear the whistling troops move across the channels, but then a driving car would stick to the center. Nonetheless, the impression seemed fairly open and lively. The surrounds kicked in with some adequate reinforcement of the forward image; examples include a rain storm and scenes with explosions. The rears also featured quiet but generally solid ambiance at other times. No, the soundfield didn’t compete with more modern efforts, but it worked nicely for a picture of this vintage. As a whole, the quality of the film’s audio seemed fairly good, but it also was quite inconsistent. These variations were most evident through the movie’s dialogue. Much of the time, speech sounded acceptably natural and accurate, but it could often become edgy and strident. Some of these changes actually occurred within the same scene; for example, during Colonel Saito’s address in chapter 11, the quality fluctuates pretty radically between front shots of the Colonel and side angles. I always found the dialogue to be intelligible, but the variations in tone were occasionally jarring. I also detected at least one occasion during which some speech seemed to bleed into the forward left channel; this occurred toward the end of the first chapter. Effects generally sounded relatively clear and full. Some thinness affected them, and distortion could be heard in scenes that included gunfire or explosions, but the effects usually came across as acceptably realistic and clean. Kwai doesn’t offer much music, but when the score did appear, it was decently smooth and clear. Actually, it boasted some respectable low end but showed fairly flat highs; the upper ranges came across as somewhat dull. Bass appeared boomy but relatively good. The soundtrack of Kwai clearly showed it age, but it seemed pretty solid nonetheless. One additional point about the movie portion of the DVD: it had the longest layer change I’ve yet witnessed, and the oddest one, too. It occurred at the end of chapter 18, right at the 1:21:16 point. The pause was a good second longer than any other I’ve seen. It’s a weird change because the movie actually goes to a different “track” after the layer switch; the film starts on “title 2” and resets both time and chapters. This means you can’t go back to any prior chapters unless you return to the main menu. Why didn’t the DVD continue on the normal path? I have no clue. It’s not a big deal, I suppose, but it sure seemed strange. It also makes chapter selection difficult; the booklet refers to 40 separately-numbered chapters, but we only get 1-18 and 1-22. While the “basic” edition of Kwai only included some very minor extras, this “Limited Edition” release tosses in a decent selection of supplements. A few of these appear on the first DVD. We find Malcolm Arnold‘s score isolated on its own audio track; it’s presented in Dolby Surround 2.0. This seemed kind of odd since Kwai includes so little music, but I don’t usually complain about anything additional, even when it appears somewhat useless, so I won’t whine about this. In addition, the first disc provides some DVD-ROM features. “Trivia Sabotage” provides a game that asks you a variety of multiple-choice questions about the film. As far as I can tell, you can get quite a few wrong and still progress, and I found no good reward for completion of the task; even if you get through without a single incorrect reply, you still only get a lame clip from the movie. It’s mildly entertaining but nothing special. Next we get a screen saver that uses original art work from the movie. “Military Strategy” includes “actual documentation based on the real bridge on the river Kwai”; it shows an interactive map of the territory and will give some factoids about the war. Lastly, we get links to: CTS Home Video, Sony Pictures Entertainment, and CTHV Online Events. The DVD-ROM materials aren’t anything terrific, but they’re moderately interesting. The second DVD features most of the supplements. We find a few different video programs, starting with a new one entitled “The Making of The Bridge on the River Kwai”. This 53-minute piece combines film clips, footage from the set and new interviews with film historian Adrian Turner and a variety of Kwai participants such as Lean’s assistants Norman Spencer and Pamela Mann Francis, camera operator Peter Newbrook, assistant editor Teddy Darvas, production designer Donald Ashton, and property master Eddie Fowlie. While I thought the program provided a decent look at the creation of the film, it was too general for my liking. The participants provide a lot of solid anecdotes, but I never got a strong feeling for the movie’s day-to-day workings. From what I understand, Kwai was a long and difficult shoot, but that impression doesn’t come across very clearly from this documentary. As such, this show offers a fairly good view of the shoot but it isn’t as definitive as I think it could have been. An “original featurette” appears as well. “The Rise and Fall of a Jungle Giant” is a six minute and 10 second piece that seems to have been shown during a post-Oscars re-release of the movie; it doesn’t mention Lawrence of Arabia, so I don’t think it comes from a re-issue at that time. In any case, this program obviously lacks depth but it’s a mildly interesting clip nonetheless. It touts the marvels of the film but doesn’t stick to a purely promotional perspective as it relates some basic details about the shoot. The best part of the featurette stem from the copious amounts of footage taken on the set; while it also includes some movie snippets, it includes a high percentage of candid material. Those bits make “Jungle Giant” worth a look. Another historical piece appears as well. Titled “On Seeing Film…”, this 15 minute and 40 second clip was produced by the University of Southern California and it’s hosted by William Holden. Apparently it comes as part of a series to educate folks on how to get the most out of their movie-viewing, and Holden discusses a number of issues to consider as one watches a film. It’s a bit pedantic but it’s kind of cool, and it also features more nice behind-the-scenes shots from Kwai, so it deserves some attention. Less interesting is “An Appreciation By John Milius”. This eight-minute piece combines film clips with talking-head shots of filmmaker Milius as he tells us why he likes Kwai so much. Granted, it’s somewhat interesting to get his perspective on the movie, but I can’t say it did a lot for me. The “Photo Montage” doesn’t use the traditional stillframe format. Instead - ala the series of “Universal Classic Monsters” DVDs - it films the images and presents them as a running video program. The piece lasts for seven minutes and 27 seconds and features a mix of movie posters, lobby cards and other advertisements. It’s a fairly nice little collection. Most Columbia-Tristar DVDs include booklets with production notes, but the Limited Edition of Kwai improves upon the usual situation. Here we find a 12-page text that apparently replicates the original “souvenir book” available during the film’s theatrical run. These notes add some solid information about the making of the movie and add a nice component to the package. Lastly, we get a few materials that also appeared on the single-DVD version of Kwai. We find trailers for Lawrence of Arabia, The Guns of Navarone, Fail-Safe, and a re-release of Kwai that touts its connection to Lawrence of Arabia. We also get “Talent Files” for Lean plus actors Holden, Guinness, Hayakawa and Jack Hawkins. As is typical of the other biographies found on Columbia-Tristar DVDs, these are very brief and provide little information. The Bridge on the River Kwai is a solid film that belongs in the collection of any movie fan; the questions revolves around which version to purchase. Both the single-disc and two-DVD sets feature the same fairly positive picture and sound; they differ through the composition of their extras. While I generally liked the supplements on the “Limited Edition” of Kwai, I must acknowledge that they disappointed me. Other two-DVD sets have been jam-packed with goodies; from Criterion’s edition of Armageddon to Disney treasures like A Bug’s Life and Tarzan and other excellent packages like Magnolia and Boogie Nights, two-disc sets make up some of the best DVDs on the market. In fact, a look at my current “Top Ten of 2000” shows that only one single-disc release resides on the chart; the DTS edition of Jaws still holds on to the tenth position, but I can guarantee it won’t still be there by the end of the year. Kwai represents Columbia-Tristar’s second two-DVD effort; the first was the also-disappointing Men In Black. However, my qualms about the MIB LE stemmed from the fact it did little to improve upon the already-solid single-disc release of the film; I questioned whether the additional content merited the additional cost. The same concern applies to Kwai. On one hand, I love supplements and enjoyed the materials in this package. One the other hand, I think the set seems overpriced for what it includes; there’s not much here for an extra $15. As such, I’d base my purchase of the LE on the price for which you can find it. If it’s not too much more than the single-disc version, go for it; the supplements aren’t special but they’re generally solid. However, I wouldn’t shell out a lot of money for the additions; I adore extras but not at any price.